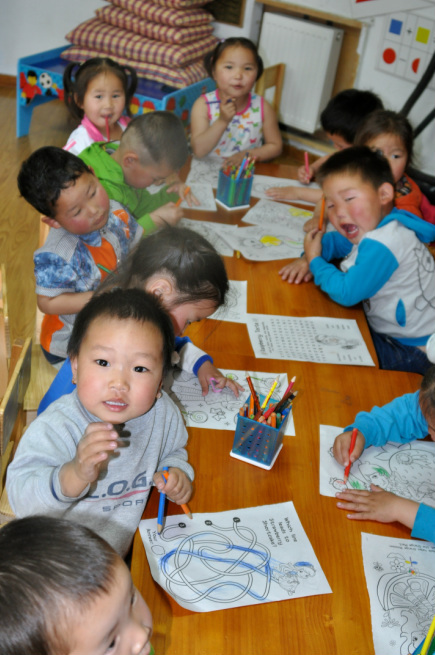 A project designed to help alleviate the suffering and neglect of the most vulnerable and marginalized children in an Ulaanbaatar neighbourhood whose residents make a living and feed and clothe their families with items scavenged from the rubbish dump. At the moment, 150 of the most seriously disadvantaged children who live in this community of approximately 250 families are being fed, cared for and educated five days a week at the Sanctuary. These children previously spent most days alone in a ger, often with little or no food or heat, being cared for by their six or seven year old siblings, with their parents scavenging at the rubbish dump for food, clothing and fuel. As most of these families previously were herders who were forced to move into the city when all their animals froze in a very harsh winter a few years ago, they are non-registered residents of Ulaanbaatar. This means they are not easily able to work. In addition, this area is not serviced by social services and many of the children are unable to attend school or receive medical care. At the sanctuary they have adult supervision, a warm place in the winter, three nutritious meals a day and varied educational and social opportunities heretofore unavailable to them. Additionally, we are providing employment for many members of the community to oversee the health, welfare, and nutrition of the children as well as providing training and volunteer opportunities for many. These people previously subsisted from what they could scavenge from the dump. One of our small business partners is a truly special woman who found an abandoned infant while working at the dump and brought her home to raise by herself along with the four children she already had. What does Narniii Huuhduud consist of? A kindergarten built from two, innovative seven-meter diameter fiberglass gers which are joined together with a small cement block building, a 4000 square foot donated modular building, a small on site house that is being refitted and is now the Brad Winters Community Library, a cement play area and a wonderful outdoor playground for the children (We are currently renovating the playground - you can donate here) along with an outdoor toilet, guard house, storage shed and a ger for our Peak Foster Care program. In our bid to have the Sanctuary help as many people as possible, we have partnered with Mongolian NGOs. Our partnership with our construction NGO resulted in the Sanctuary providing an opportunity for many local, previously homeless alcoholics to gain valuable skills and work experience on their path to rehabilitation and self-sufficiency. Another NGO partner, the Communication Development Center, is headed by a man who was himself a dump child and has worked extensively within the community to help others find a path into mainstream Mongolian society. ​ of cleanliness and hygiene. If you want to support any of our current and future projects email us or donate here.